On a cold and drizzly November day, there’s nothing quite like splitting firewood to warm a body. And if you’re splitting firewood for a local wood bank, from trees carefully harvested from a healthy forest on land that’s owned in a way that promotes social equity? Well, that’s an unbeatable way to warm body, heart, and soul. 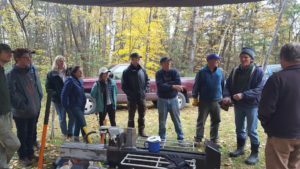 On November 1, students in the University of Vermont’s Community-Based Conservation class gathered at the Little Hogback Community Forest in Monkton to do just that. When VFF board member Deb Brighton developed the idea for the Little Hogback Community Forest back in 2007, she was motivated by compelling ecological, economic, and social issues surrounding forest ownership in Vermont. Buying and owning forestland was no longer an economically sensible investment. Instead, rising property values had essentially made owning a forest a luxury, affordable only to wealthier households, and out of the reach of many of the community members who have traditionally hunted, hiked, and harvested there. What emerged through her efforts is a remarkable experiment in forest ownership and conservation, now in its eleventh year. Sixteen shareholders jointly own the 115-acre Little Hogback Community Forest. The Vermont Land Trust holds a conservation easement on the land, which ensures that the land will be carefully managed and never subdivided or developed. This development restriction has the added benefit of lowering the value, and therefore the price, of the land. LHCF member John McNerney (left) demonstrates light-on-the-land log forwarding. Eight of the 16 shares are reserved and subsidized for community members whose family income falls below the county median (currently about $61,000). 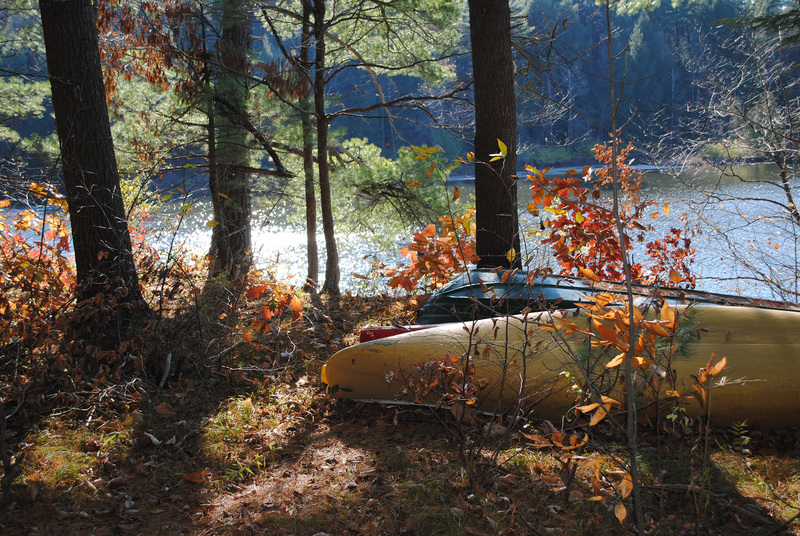 Each shareholder purchases the right to enjoy and profit from carefully conserved forestland—to participate in conservation practices, harvest timber, tap maple trees, hike, camp, and so on. Vermont Family Forests holds a covenant that limits the value of each share to one that an investor could pay with the expectation of a modest rate of return from the land under careful management. By lowering the initial price of the land, this covenant makes the parcel perpetually affordable to community members who need a return on their investment. 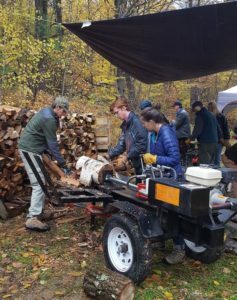 UVM students split wood for the Monkton Wood Bank with a hydraulic splitter. 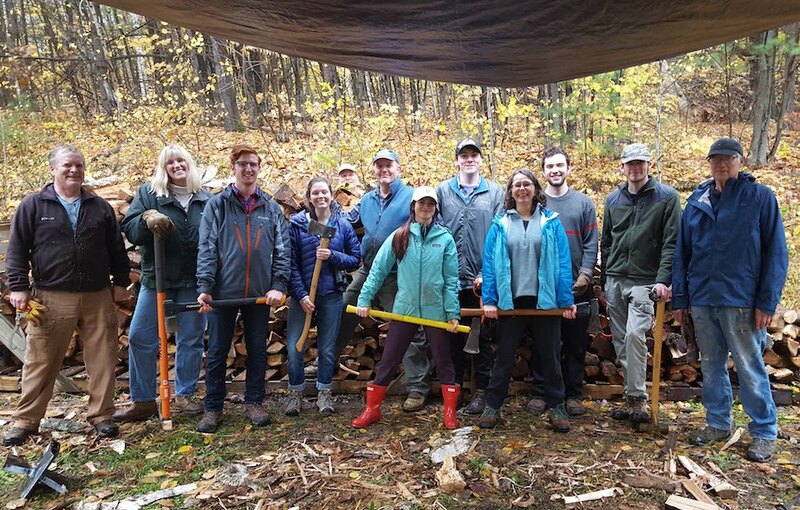 Each fall, for the past few years, LHCF shareholders have shared their forest, their experience and the chance to split firewood for a great local cause with UVM professor Cecilia Danks and her students. 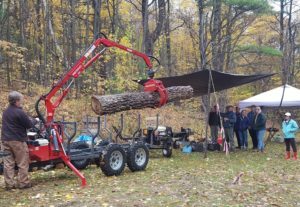 Several LHCF members were on hand at the recent wood splitting event, including John McNerney, who brought along his new forwarding trailer to show students this light-on-the-land tool for moving logs out of the forest. VFF Executive Director David Brynn described to students how the LHCF came to be and how management of the land aims for full compliance with VFF’s checklist of forest conservation practices. These optimal conservation practices take care of land and water. They lessen erosion and help slow, spread, and sink the flow of runoff. They allow better quality trees to grow, building up the “endowment” of the forest. They keep the forest healthy while cultivating benefits to shareholder members and the broader community. Students also split plenty of wood the old-fashioned way. LHCF members shared their experience as landowners, and their motivations for buying in. They explained how they’re currently figuring out criteria for new members since, for the first time in the 11 years, they have two subsidized shares for sale. The UVM students listened and delved deeper with their own questions. Then everyone jumped into the work at hand. Students used both hydraulic splitters and axes to split the wood, and slowly and steadily the pile of split wood grew. Hot dogs sputtered on a grill to fuel the hard work, along with sandwiches, cookies, and hot chocolate. By the afternoon’s end, about three cords of wood lay stacked on pallets for the Monkton Wood Bank. Since the wood will need to cure for a year, it will be part of next winter’s wood supply. LHCF member Lee Kauppila, who fields the calls requesting wood from the Monkton Wood Bank, explained how the wood bank works. 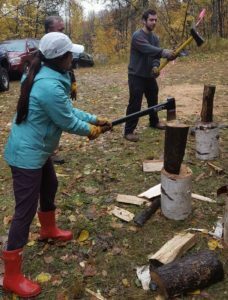 This volunteer-led program supplies wood in emergency heating situations throughout the winter, in coordination with H.O.P.E (Helping Overcome Poverty’s Effects). Meeting local needs with homegrown solutions. Taking care of the land and each other. That’s what it’s all about. Deep thanks to all for a great and inspiring day in the woods.